Though America’s economic expansion is now in its seventh year, many South Carolina communities remain distressed, crimping residents’ chances of achieving economic stability or success in their lifetimes, according to a new study. For people living in economically hurting communities in South Carolina and elsewhere, the report said, the past few years of overall U.S. recovery have felt much more like an ongoing downturn. In distressed communities nationwide, employment declined by almost 7 percent and the number of business establishments fell by 8 percent from 2010 to 2013. In these areas, nearly one-quarter of adults have no school degree and 55 percent of adults are not working. The report’s findings, the authors write, are alarming because of a growing body of evidence that the more time an individual spends in a distressed community – especially at childhood – the worse the individual’s chances of ever achieving economic stability. While the United States is still regarded as a land of opportunity, the report concludes, when it comes to life outcomes, geography is too often destiny. While in these distressed areas economic conditions continue to feel recession-like, the nation’s most prosperous communities have done quite well. Employment in the best-off 20 percent of America’s zip codes enjoyed 17 percent job growth and had a 9 percent increase in business establishments from 2010 to 2013. 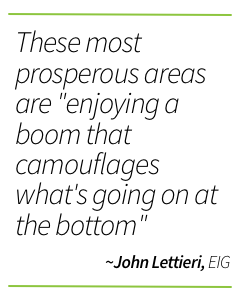 These most prosperous areas are “enjoying a boom that camouflages what’s going on at the bottom,” said Lettieri. In South Carolina, 15 percent of the population lives in these prosperous zip codes. The Economic Innovation Group was established in 2015 with backing from several well-known technology entrepreneurs, and includes both conservative and liberal economists on its advisory board. The group said it will craft centrist proposals to stimulate the economy and push Congress to enact them. Lettieri, one of the co-founders of the group, is a South Carolina Republican and onetime staffer to former Republican Sen. Chuck Hagel, according to Politico.